There’s a terribly focussed feel to this July Synod. Although the agenda is full of ‘normal’ business – some liturgy, lots of legislation, the annual financial stuff, and so on – everyone knows that This Is The Time To Sort It Out. So you want to know how we decide? Here’s my simples guide to will it happen (or not happen. Take nothing for granted.) Like Parliament, we have a multi-stage process. The first stages are over: we have decided that we will have women Bishops, and voting in the dioceses has overwhelmingly supported that. This weekend’s debates are about the nuts and bolts. They are quite large nuts and bolts. Today (Friday) we’ll formally be told the results of the diocesan votes. Assuming that we then agree to ‘take note’ of them, we’ll look at the proposals the Steering Committee in charge of the legislation are making to put things into effect. By suppertime that will be done. We’re often told that the Church of England is ‘episcopally led and synodically governed’. That comes into play today. The episcopal bit comes first. Assuming Synod agrees the Steering Committee’s cunning plans, the House of Bishops take over for the next stage, holding a breakfast time meeting tomorrow (Saturday). In the jargon, it is ‘Article 7 business’, and they get to call the shots. If the Bishops like what they see (and we can assume that they will), the synodically governed bit comes in. The separate Houses (clergy and laity) can, if they wish, hold special meetings to discuss the final proposals. That would happen on Sunday afternoon, breaking a tradition that we tend not to do controversial business on the Sabbath. I sincerely hope that the separate Houses do not claim a reference on Sunday. It’s not that I’m a strict Sabbatarian. I just think that everything that needs saying has already been said, or will be said on Monday. The only reasons for having the Houses meeting would be psephological (ooh-er!) – to test the water and see what the voting numbers might eventually be – or political – to try to wreck the whole thing by getting one of the Houses to reject it. I sense no appetite for separate House meetings, so we’ll then proceed to a full Final Approval debate on Monday. One of the Archbishops will be in the chair. The key vote will be on the Measure, and will need a two-thirds majority in each House if it is to go through. Yes, but will it go through? Predictions are impossible. The Church Times last week made much of the fact that they had found 6 ‘swing voters’: people who voted against the last proposals, but are willing to go with these. But on the other hand, there are 10 new Synod members. So if you want to play the numbers game: it could be tight. On the other hand, this package has been publicly welcomed by leading lights from Reform and Forward in Faith. But that doesn’t mean they will feel they can vote for it. Some may abstain (thus helping the maths of getting two-thirds); others will vote with their conscience – against. Dissolve this Synod and call fresh elections. Start the whole process in Parliament (with the Bishops in the House of Lords) and get the legislation through there (i.e. by-passing Synod). Calling fresh elections (it sounds so very grand) will annoy the voters (members of Deanery Synods). But there may be some calculations here: Deanery Synods themselves are newly elected. There is widespread annoyance at the way the House of Laity voted last time. It might be a fair guess that DS members will not elect a new General Synod with as many ‘nay-sayers’ as the present lot. But is there any point in a dissolution when a new synod is due to be elected this time next year anyway? Getting Parliament to initiate a change is a very seriously difficult idea. The history is not exactly encouraging. Ever since the 1919 Enabling Act, the Church has been in the driving seat, even though Parliament gets the final say in heavyweight Church business. And the debacle over the 1928 Prayer Book (the Church proposed it, Parliament, with some pretty serious lobbying, rejected it) ought to indicate that is not a route we should want to take. It’s fraught with theological difficulties that neither Catholics nor Evangelicals should relish. I think this idea is a bluff, myself. Someone (either Andrew Brown or his ‘senior sources’) is trying to put the frighteners on those who are still undecided. If the voting is as tight as we fear it might be, it’s possible that in the debate the Bishops may produce some rabbits out of their mitres in order to help ‘swing voters’ decide. One olive branch already emanating from Lambeth is the commitment to find a way to ensure a ‘conservative headship evangelical’ Bishop is appointed. This might head off some of the grumpier Reform-minded opponents. Though, judging by a rather sour article by Susie Leafe in the Church of England Newspaper a couple of weeks ago, they are not in receptive mood, even for olive branches. Other bright and helpful ideas may yet be voiced. If you want to follow this little whirlpool of fun, there is a live audio/video stream via the Church of England website here. Regular readers will recall that last time we got this far, the House of Laity did not get the required majority – by 6 votes. So Monday’s vote is the one to watch. We begin the debate at 11.15, and the vote could happen at some point in the afternoon. The business is scheduled to be finished by 6.15, but as (in the jargon) it is Article 8 business, the debate cannot be guillotined, and must go on until everyone who wishes to speak has done so. Do pray for self-restraint or we’ll be there all day! And I will blog about other stuff during the weekend. Honest! 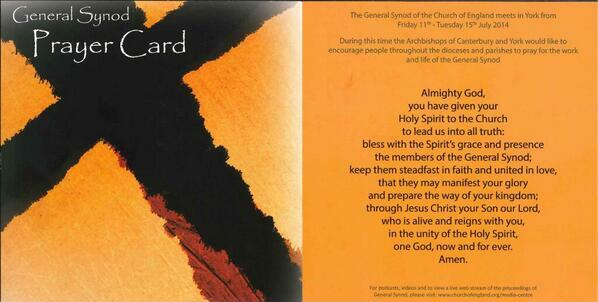 Image | This entry was posted in General Synod and tagged Church of England, women Bishops. Bookmark the permalink.